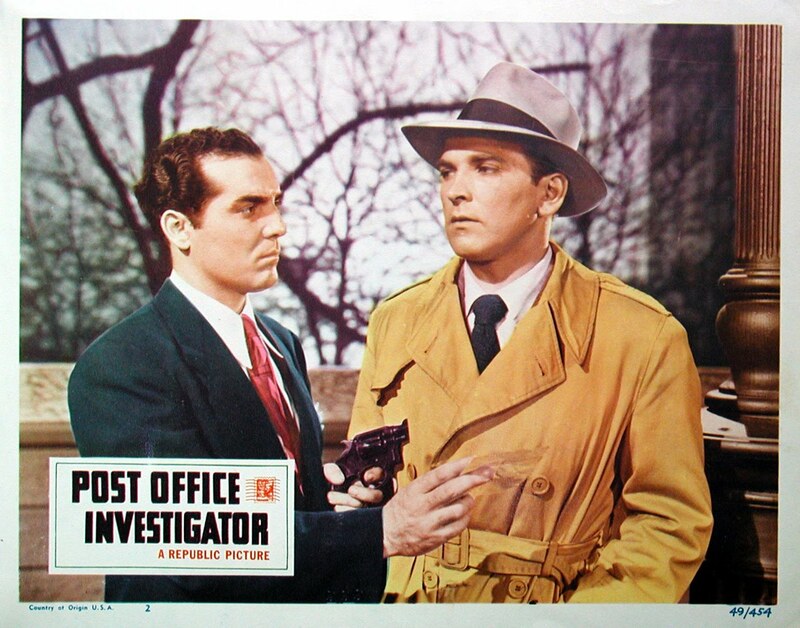 POST OFFICE INVESTIGATOR (1949) is a low-budget 60-minute crime film released by Republic Pictures. The movie was a reunion for leads Warren Douglas and Audrey Long, who had costarred as crime-solving honeymooners in the previous year's HOMICIDE FOR THREE (1948). This time around Audrey is the femme fatale, who helps pull off a con job which involves swiping a rare stamp worth $100,000. As part of the plan her partner in crime mails the stamp, but Audrey pulls off a double-cross and convinces gullible postman Douglas to retrieve the letter from the mailbox and give it to her so she won't lose her mythical job. She rewards him with the promise of a date, but when he shows up, she doesn't work at the law firm she'd claimed to work at. Lucky for Douglas, cute Jeff Donnell does work at the firm, and she ends up going out with him instead! 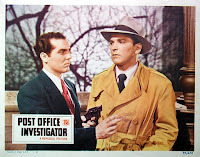 Douglas's life is threatened and eventually he has to come clean to the postal inspector that he broke regulations and gave Long the envelope. He redeems himself by going undercover to help break the case, although as it turns out Donnell will also play a key role, recognizing Long and tailing her at a critical juncture. In the end it appears Douglas will be allowed to keep his job and end up with Donnell while Long goes off to the slammer, so all's well that ends well! The big draw for me with this film was the presence of the two leading ladies, Audrey Long and Jeff Donnell. 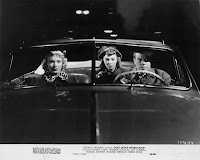 It was quite different seeing Long play a woman who swindles, shoots, and freely talks about bumping people off, as she more typically plays the innocent type in films such as BORN TO KILL (1947) and DESPERATE (1947). I'm struck by what a chameleon Long can be; like noir actress Coleen Gray, her entire appearance can be very much changed when she changes her hairstyle. Donnell is someone who's really grown on me over the years, with my favorite Donnell roles including IN A LONELY PLACE (1950) and FLIGHT NURSE (1953). For a movie with a short running time and a lot of crime, it would still be a fairly plodding low-rent affair if not for Donnell's perky charm. She enlivens every scene in which she appears. 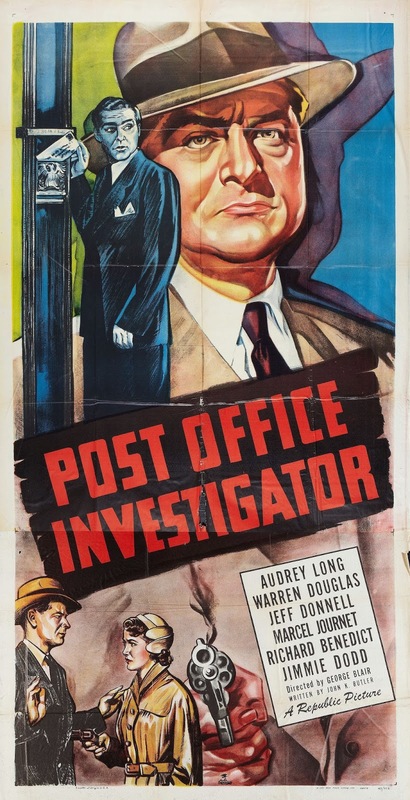 POST OFFICE INVESTIGATOR was directed by George Blair, who also directed HOMICIDE FOR THREE, and filmed in black and white by John MacBurnie. The supporting cast includes Jimmie Dodd, Thomas Browne Henry, Marcel Journet, Cliff Clark, Vera Marshe, Emmett Vogan, and Jason Robards (Sr.). Apparently I missed picking out Robert J. Wilke as a policeman; it's always fun to see one of the great '50s Western villains on the side of law and order. Many thanks to John Knight for his help seeing this movie.